Problem. In every conversation, there's a little bit of magic, a spark of genius containing important decisions and discussions. The problem is, the information is rarely accurately captured and manual summaries are time-consuming. This means your company runs the risk of losing important knowledge or lacks efficient follow-up. Solution. Anytime you have a meeting, Notiv is there to gather and summarize important bits of information. You'll always have a single source of truth for every conversation, decision and action item that shapes your outcomes. Revisit and share these meetings at anytime with ease. Whether your meeting is in-person, online or on a call, Notiv can capture them all. So, you're secure in the knowledge that you won't miss a beat. 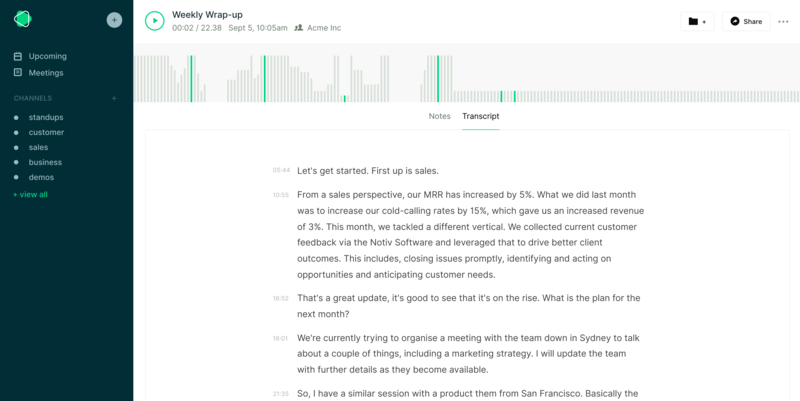 Notiv will analyse your meeting and identify the key topics that you discussed. Now, you can determine if your meeting was successful! Deliver meaningful client conversations. All you really need to be productive are your top 5 key points from your meeting. Notiv helps you sift through all the unnecessary so that you only hear the good stuff. Notes, action points and a summary rolled into one digestible document. Notiv will simplify your workflow.